When thinking of the Olympics, a lot of people imagine hot sand, clear blue water, and fireworks, but what is currently approaching is far from that. Starting on Feb. 7 and ending on Feb. 23 are the cold, intense Winter Olympics being held in Sochi, Russia. To honor this major event, here are some fun facts about the Games. One of the biggest events of every Olympics is the ceremonial torch. This event was introduced in the 1928 Summer Olympic games in Amsterdam. 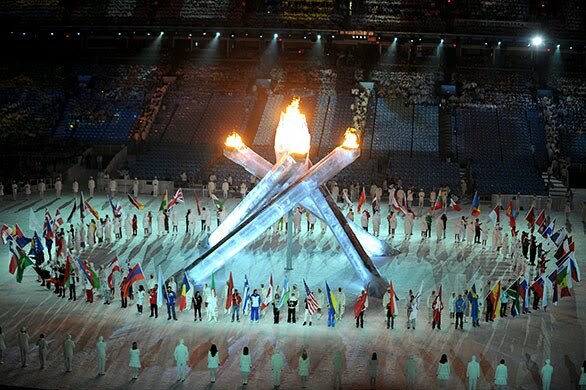 It may seem like a small piece of the Games, but that little torch travels for through Russia and passes through the hands of 14,000 torchbearers. Over the years, events have been cut from the Winter Olympics. Speed skiing was pulled after the death of skier Nicolas Bochatay who lost control due to his speed in 1992, the morning of the finals. Bandy, which is like hockey but with a ball, was cut because it seemed unnecessary. Disabled skiing was no longer needed when the Paralympics were introduced. Winter Pentathlon was pulled because there was already a summer version and Olympic fans found no interest in it. Sled dog racing was pulled because only USA and Canada competed. After all of these cuts, there are now only 15 events. Apolo Ohno is the “most decorated” American athlete, having won the most medals at the Winter Olympics for America. Bonnie Blair, a Speed Skater, has won six medals at the Winter Olympic Games, being the American female with the most medals. The worldwide record is held by Bjorn Dählie of Norway, who is the holder of 8 gold medals and 4 silver. Jacob Tullin Thams of Norway, Eddie Eagan from USA, Christa Luding-Rothenburger of Germany, and Clara Hughes of Canada are the only four athletes to have won medals at both the Summer and Winter Olympics. Thams had received a gold medal in ski jumping and a silver medal in sailing. Eagan is the only athlete to ever receive gold in the Summer and Winter Games. He medaled in boxing and four-man bobsled. Christa received gold as a speed skater and silver as a track cyclist. Hughes was a gold-medalist in speed skating and a bronze winner in cycling. While the Summer Olympics began in 1896 Athens, Greece, the Winter Olympics are much newer, having just begun in 1924 Chamonix, France. Since this, the Games have alternated seasons every two years, making this the 22nd Winter Games. For every Olympics, there are different medals. For this year, 1,300 medals have been crafted. Each medal has been engraved in Russian, English, and French. At the 1998 Japan Games, 15-year-old American figure skater Tara Lipinski became the youngest individual Olympic champion, a title that she still holds to this day. The oldest medalist was Robin Walsh in 1924. He was 65 and died a year later, the day after his birthday. By the end of the Olympics on Feb. 23, America will have taken over 1,539 hours of coverage on the Winter Olympics, though this is spread over six different platforms. The next Winter Games will be in 2018. This will be the first time that South Korea will hold the Winter Olympics, though in 1988, the Summer Olympic Games were held in Seoul. Let the Games begin, and may the odds be ever in your favorite athlete’s favor!